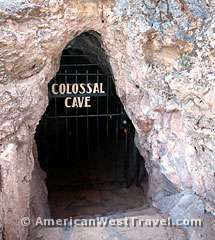 Gerry and I planned a quick tour at Colossal Cave Mountain Park, just outside of Tucson, Arizona, mainly to avoid the rush hour traffic returning to Phoenix. Our quick stop ended up a bit more exciting than we bargained for. 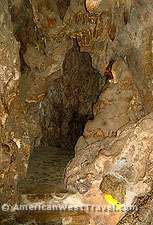 Colossal Cave is a large limestone cave which we had first visited in 1976. At that time the drive from I-10 was seven miles on a mostly lonely road through open desert. This time, we pass through the lively town of Vail and then a valley full of tract housing as far as the eye could see. Back then, we took the standard tourist tour through the cave, 45 minutes on paved trails with steps in the steep areas. This time we opted for the 90-minute Ladder Tour which promised access to less developed areas of the cave not seen on the main tour. There was also available a more extensive Wild Cave tour promising extensive physical challenges in undeveloped parts of the cave. The cave has a long human history dating back over a thousand years. 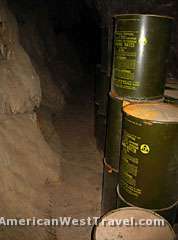 Artifacts from the ancient Hohokam people were found in the upper reaches of the cave. 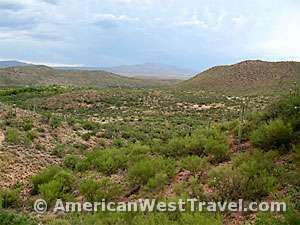 The Hohokam settled in and farmed the valley below the cave entrance as early as 900 A.D. The valley later became part of the contemporary La Posta Quemada Ranch. 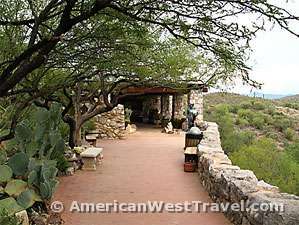 The cave also had an Old West history as a hideout for train robbers and a source of bat guano for miners. Primitive exploration and tours began in the late 19th century. During the Depression, the state obtained control of the land from the leaseholder allowing the Civilian Conservation Corps (CCC) to develop the site for formal tourism. Among the many improvements, they put the paved trails and steps into the cave, and built the stonewalled visitor center that is there to this day. The CCC also built the roads, picnic and camping areas near the ranch. 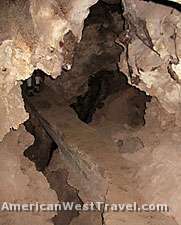 The county later took control of the cave and eventually acquired the La Posta Quemada Ranch combining it with the cave to form Colossal Cave Mountain Park. The ranch area offers museums, specialized gardens, picnic and camping areas, a play area, trails, and riding stables. A private vendor manages the park and conducts the tour. Having had previous caving experience, we should have expected the unexpected when our Ladder Tour guide showed up in long pants, elbow pads, kneepads, boots, plus helmets (with lights) for each of us. That’s how you dress up to do hard work in a cave. We’re wearing t-shirts and shorts. At least I brought along my boots. We start into the cave and get a brief orientation from our guide along the main trail. Colossal Cave itself is a limestone cavern decorated with typical formations such as stalagmites (ground up), stalactites (ceiling down), columns (where stalagmites and stalactites grow into each other), flowstone, and more. However the cave has been dry for thousands of years. The formations no longer grow without the presence of water and slowly turn a dirty brown color. 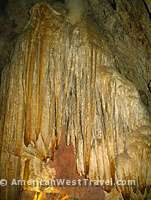 In wet, living caves such as Kartchner Caverns in nearby Benson the formations have a beautiful clean white appearance – not unlike marble – and may even glisten in their moisture. 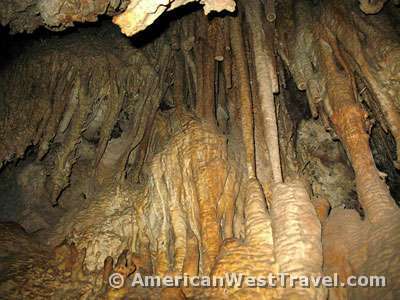 Colossal Cave is also a bit like a Swiss cheese with openings and crevices everywhere. In our 90 minutes of exploring we were probably no more than a quarter mile from the cave entrance. The numerous side trails generally came back about to where they started but through a different opening. The Ladder Tour works through a number of these very narrow side passages, often with lighting only from the helmets and little room to move about. 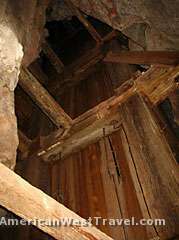 The ladders were only about six inches wide and used to gain access to a new opening sharply above or below your current position, never more than about seven or eight feet either way. A couple of jump ups without ladders required some pretty serious squirming to gain access. With about a half hour to go, our guide announces that he’s going to give us a taste of wild caving for the remainder of the tour. 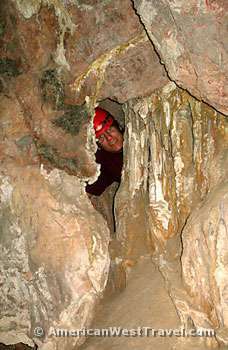 Non-technical (no ropes or climbing skills required) wild caving is not risky but can be very physically strenuous and requires physical agility. (Those with a wide girth or claustrophobia are advised to stick with the main tour.) Without the knee and elbow pads you can get bruised and cut up. At least we had the helmets. I whacked myself hard on the helmet numerous times on this trip. The challenge of wild caving is negotiating extremely narrow passages or steep drop offs or jump ups. Normally, the guide already knows the solution at a tough spot and will explain what you have to do to get through. One challenging spot was a very narrow crevice with a sharp upward turn. We had to lie on our backs crawling forward then sitting up into the upward turn. As we grasped for a handhold overhead, the key move was pushing off with the left leg on a protruding rock. Since we could no longer see the legs at that point, the trick was to feel for the rock with your foot. When it was over, I was indeed covered with dirt from head to foot and bleeding from both an elbow and knee. But that’s okay. When you’re out on the road, sometimes it’s good to be surprised. For more information on Colossal Cave Mountain Park, please visit their website, ColossalCave.com or call them at (520) 647-PARK (7275).